I love that so many of you had other tips to contribute to the discussion on working flat hems on a stockinette sweater. Knitters are so clever. You'd think a hem would be simple, and that there would be only one way to do it, but nope. There are so many different methods to choose from. Note that some methods might work differently with different yarns, so if you are in doubt, work a little swatch and put a little hem on it and see how you like it. Eunny didn't use a purl turning row, and it looks great! Several of you noted an alternate way to work the turning round: Work a single round of purl stitches, then work the second half of the hem. The purl stitches will form a natural little indentation on the inside of your fabric, allowing the hem to lay flatter. If you are working a picot turning round, Laurel D. suggests trying a p2tog instead of a k2tog during the fold-over round, saying that this will make the points sharper and more dramatic. So if you want dramatic points, p2tog here; if you want softer points, k2tog. Here's Kathryn T.'s tip for making the hemming round easier: "To make it a bit less cumbersome when you get to the point of turning up the hem and knitting 2 together off two needles, I go round first and just slip one off each needle alternately. This means that all the stitches are on the same needle, and then you can just go round and k2tog. And a final funky and fun tip is again from Laurel D.: "If you think you will be short of yarn, or you just want the surprise, you can do the middle rows of the inside hem in a complementary yarn. 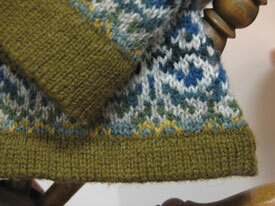 Just make the sure the end rows of the inside hem is in the yarn of the outside of the garment. If your yarn is bulky, using a lighter weight yarn for the hem works nicely." Presenting….The Barrymore Slouch Hat, by Lisa Shroyer! This is a fast, fun project, and it's free to download along with five other easy knitting patterns! Download the Barrymore Slouch Hat. Have a question or something to say? Sure you do! Leave a comment! 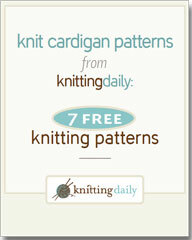 Every knitter has dreamed of the perfect cardigan pattern that he or she might knit some day. From a cozy cable knit to luminous lace, this free ebook will be your dream come true. This is a wonderful and varied collection of cardigans-which is one of the most important pieces in your wardrobe. You'll want to make every one of these knit cardigan patterns, so download your free eBook now and get started (and don’t forget to tell a friend so they can enjoy their own copy! ).